I took a business trip to Virginia yesterday, and used my commute time as a much needed breakout time (free time away from work to refresh and reinvigorate my mind). Ain't nothing like a long drive! When I arrived home, I was greeted with a wonderful surprise - 2 issues (February and March) of Ebony Magazine in my mailbox. I was surprised because I don't have a subscription, and this was the one magazine I didn't have in my Next Issue digital subscription. The February issue with Nick Cannon and Mariah Carey on the cover, is a special tribute to Nelson Mandela, as well as a celebration of black love. 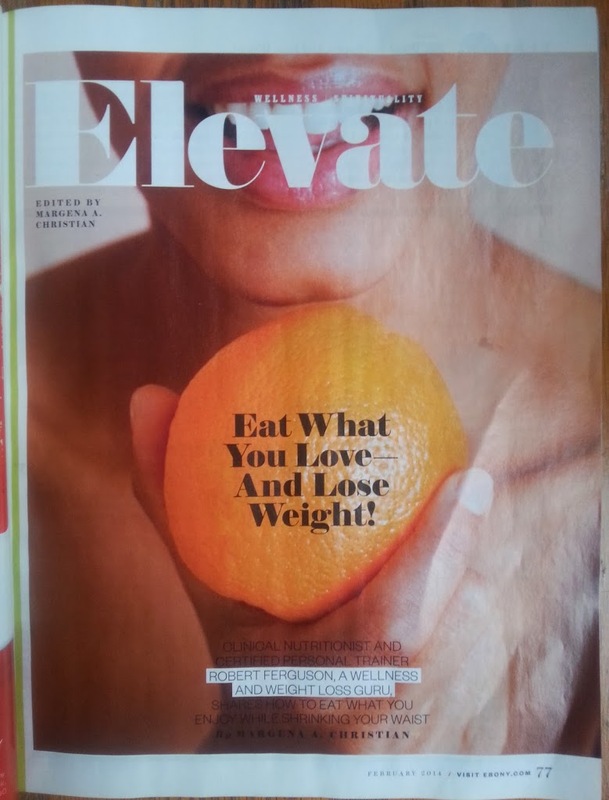 As I browsed through I came across an article in the Elevate: Wellness and Spirituality section, "Eat What You Love and Lose Weight!" In the article clinical nutritionist, personal trainer, wellness and weight loss guru Robert Ferguson shared how to live the diet free life and shrink your waist while eating what you enjoy. I was inspired by 5-foot-3-inch Daphne Washington (a nurse) who on this Diet Free Life Program, went from 187 pounds, acid reflux medication, hypertension and high cholesterol to an impressive 120 pounds and now teaching Zumba. This lifestyle friendly program is built on the premise of portion control and meal balance, not deprivation and restrictions. Just the pure freedom to eat the food you love while maximizing the fat-burning potential of your metabolism. While exercise is important the focus is all about intake first; with three meals per day and snacks in between. Once you start feeling good and is ready then you can add exercise. This is another step to help create a healthy me, I'm getting started today.